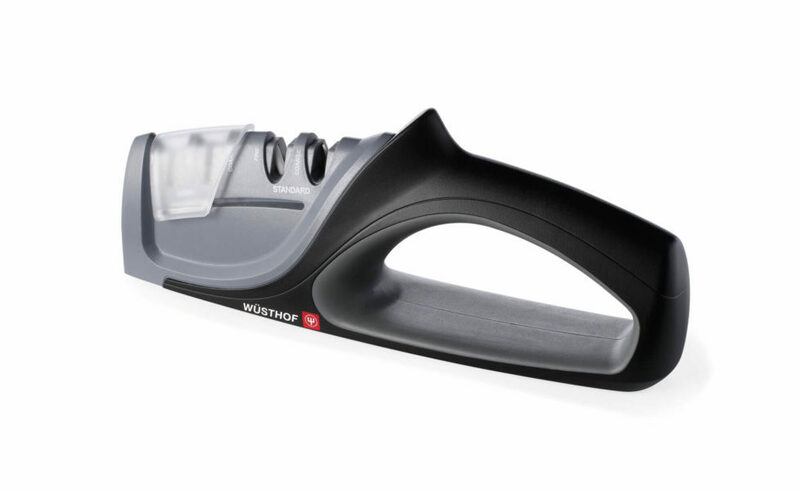 Best Manual Knife Sharpener For 2019 – Top 7 Models Reviewed! Even the sharpest knives dull after extensive use, so having a good sharpener in your kitchen is necessary. But how do you figure out which is the best manual knife sharpener available?If this is your first time to buy one of these, it’s essential you choose the right products for the job. The Chef’s Choice 463 Pronto Santoku/Asian Manual Knife Sharpener is ideal for honing Asian knives and serrated blades. The Chef’s Choice 4633 3 Stage Manual Knife Sharpener is for kitchen and household knives as well as Asian, American and European knives. The Chef’s Choice 4643 3 Stage Manual Knife Sharpener is suited for sports knives, santoku and those who want burr free edges. The Wusthof 2-Stage Knife Sharpener is for those who need a ceramic sharpener to hone blades. The Wusthof Precision Edge 4 Stage Knife Sharpener is ideal for sharpening Asian style knives at 26 or 14 degrees. If you’re searching for an affordable all-purpose knife sharpener, Smith’s 50264 Adjustable Manual Knife Sharpener is a good choice. Here are more detailed Manual Knife Sharpener reviews to help you decide which one of these to get. The 50264 sharpener is aimed primarily at sports buffs who like their knives sharp. It is compatible with all popular knives including serrated and straight, and it also uses a two-stage process for fine and coarse knives so you get the best possible results. The sharpener can also be used on sharp knives so they retain their edge, and it comes with a knob for 14 or 28 degrees on the side. If you have a serrated blade you can use the fixed angle slot so it is sharpened fully. The sharpener is durable but you can replace the components if necessary. With its soft handle, you’ll feel comfortable holding the sharpener as it hones your knife. Those who use the Smth like its rubber feet as it is non-slip and doesn’t move when you apply pressure. New users also like its safety features. While aimed at sports buffs, the sharpener is versatile enough to be used on kitchen and hunting knives. This manual knife sharpener operates in two stages, sharpening the blade and then polishing it. The sharpener uses diamond abrasives on both instances so it is able to sharpen different alloys without the need for oil or water. The sharpener gives you precision control over the bevel angle so you can sharpen knives at 15 degrees. This makes the 463 ideal for Asian knives as well as those from other countries. The soft touch handle makes the sharpener comfortable to hold even for long periods. Even those who haven’t used knife sharpeners before will find this tool handy and convenient to use. The Chef’s Choice 4633 sharpens and hones blades in three stages so you get optimum results during the process. The sharpener is designed for American, Asian and European knives, giving you lots of flexibility. The 4633 lets you sharpen knives at 20 and 15 degrees, the most commonly used for knives. The sharpener also works with serrated and straight blades as well as santoku, pocket and sports knives. The abrasives used in stages 1 to 3 is diamond so you get fast results. The 4633 also uses the Chef’s Choice sharpening technology so the edge stays longer and you get double bevel. The 4633 sharpens the length of the blade so you get maximum performance from the knife. The sharpener provides the same results for serrated and straight edge blades, so no need to use separate sharpeners for your knives. People like the slip resistant sharpener handle, and its rubberized bottom ensures the sharpener won’t slip while you’re using it. It’s also earned good feedback from right and left hand users. The 4643 is a 3 stage knife sharpener aimed at various types of knives including those made in the US, Europe, and Asia. It uses criss-cross sharpening technology so your knife’ edge is burr free. The 4643 provides a more durable arch shaped edge for the blade, and the bevel panel control is very accurate for 20 and 15 degrees. Like other Chef’s Choice knife sharpeners, the 4643 abrasives are diamond so it sharpens knives quickly. The sharpener works for different types of blades, making it compatible with a wide array of knives in the market. The honing stage is separate from the sharpening, so by the end of the process, your knife has a sharp edge and suited for heavy duty use again. The knife is fully made and assembled in the United States. Those who bought the 4643 say the sharpener is effective and fast, and others claim it is very good at prolonging the lifespan of kitchen knives. This sharpener uses hard carbide steel to sharpen dull knives, and during the honing stage it uses ceramic rods. This procedure ensures the blades receive maximum sharpening without leaving any nicks or dents. The Wusthof also comes with with a slot so you can hone scissors, and the rubber base provides you with a comfortable grip. The Wusthof is easy to use and it is durable enough to handle several knives and blades. There is no need to apply a lot of pressure when sharpening a knife. Just a small amount is necessary and the Wusthof will do the rest. There is even less pressure required during the honing stage. Customers say the Wusthof does sharpening and honing very well, and it is also one of the durable. Lastly we have to point out the compact design makes this an ideal choice if space is limited in your kitchen. Wusthof has several knife sharpeners already, but this is one that manages to stand out. The 130 sharpens all kinds of 20 degree knives, and the diamond abrasives works on serrated and straight blades. The versatile design also means it is compatible with santoku, pocket and different kinds of kitchen knives. The 130 works in three stages. The first level uses 100% diamond abrasives while on stage 2, hardened steel is used, and in stage 3 it uses stropping disks. The 130 sharpener also uses accurate angle guides on each stage so there is no guesswork involved. The sharpener also makes full use of miniature steel that has been hardened, and its angle guides have sharpened serrations so your knife has that extra bite. During stage 3, you can use its abrasive disk mechanism to get a smooth, very sharp edge. It is also the stropping disk that aligns and straightens the serrations. Those who bought the 130 like its easy operation, with the press of the button is all it takes and the sharpener does the rest. During the sharpening process, the 130 utilizes diamond based rotating conical disks for superior results. The Wusthof Precision Edge is designed to sharpen standard American knives and Asian type knives. The sharpener comes with a carbide steel which it uses for sharpening without damaging the blade. The sharpener base is rubberized so it remains stable as you use it. The Wusthof has a weight to it, and that’s a good thing as it adds balance to the unit. You can set the carbide blades to 28 or 14 degrees to give your knives that sharp edge. If you have Asian knives, just move the cover so you can sharpen the knife to 10 or 2 degrees along the side. Either way, the V-shaped head is going to sharpen the knife quickly. The honing stage involves the use of ceramic rods, and the process works the same way for different knives. Customers like the sharpening and honing process as it doesn’t take too long and you will see the difference with the knife. Your knife won’t just feel sharp, but it’s going to retain the edge longer. The knife sharpener should hone knives without leaving scratches or nicks on it. You should also get a smooth edge consistently. Get the best knife sharpener you can buy if you are a chef or just use a lot of knives. The sharpener surface must be hard and abrasive for efficient results. Diamond is the hardest and fastest material used for sharpening along with polished ceramic and tungsten carbide. Grit is used to measure abrasiveness, and the higher the number the finer it is. So a 1000 grit material is fine while 120 grit is coarse. Other sharpeners may use abrasives, so read the product description first. A good knife sharpener lets you hone knives at different angles like 20 and 15 degrees. Other sharpeners let you set the angles at 14 degrees or 28 degrees. The right angle depends on what types of knives you use. Most of these tools have sharpening levels. Stage 1 usually hones the knife and the second stage polishes it. Some even have 3 to 4 stages. The sharpener must have safety features so you don’t injure yourself while sharpening the knife. Manual sharpening tools usually have a wall that separates the blade and your fingers. All good products have warranties, and knife sharpeners are no exception. This is true for knife sharpeners as well. The only way you will really know if the knife sharpener works is if by trying it. In the event it doesn’t work out, you should be able to return it and get a refund. What type of knives do you sharpen often? There are many types of knives, and that should factor in your decision on what to buy. Some sharpeners are all-purpose, while others are for Asian knives, European or other variants. Compact knife sharpeners are ideal if you have limited space on your kitchen countertop. A large sharpener may be ideal if you have lots of large knives. Each manual knife sharpener review here took into account their features, pros, and cons. After going through each one, we have concluded the Chef’s Choice 463 Pronto Santoku Knife Sharpener is the best. We like how quickly it sharpens blades, the comfortable handle and that it is lightweight. The Chef’s Choice 463 Pronto Santoku/Asian Manual Knife Sharpener is also versatile and works with different types of knives.